S-10 Forum > Truck Of The Month > Truck Of The Month Winners > Custom Bumpers?? I'm new to the page but I have a 1997 Chevy S10 Ext Cab. I'm looking for custom bumpers, preferably out of diamond plate steel. I've looked all over the web trying to find someone who makes them or the DIY ones were I'll have to weld them together but can't find a damn thing. If anyone knows any shops in their hometown who would do it I have no problem either driving to them if they are close or paying for them to ship. Thanks everyone! 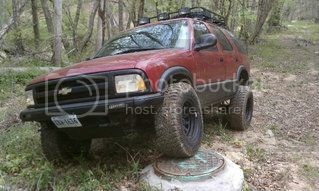 Google "s10 winch bumper" it's easy to find the two maybe three companies that make them. You won't find diamond plate or precut diy tho. Oh okay.. Thank you very much! !